Wow you are looking cool - becomes the most appreciative compliment for anyone during hot summer days, isn’t it? Why not make this summer different by gifting away cooler sunglasses? Cool and trendy feeling automatically wears upon a person adorning, customized classic sunglasses – orange and they are all set to dazzle others with their choice! Businesses that are planning to grab maximum profits this summer can easily get away by investing in promotional classic sunglasses – orange imprinted with their brand symbols ( over imprint area - 1 1/2" X 3/8"). 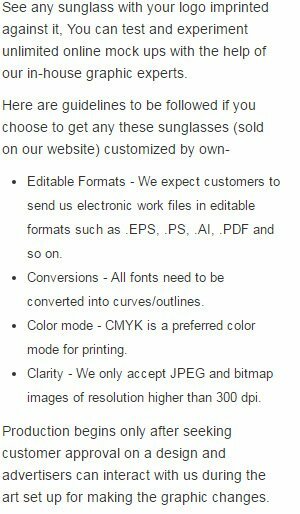 Personalized classic sunglasses – orange can be gifted to customers during summer parties, annual gatherings, promotional campaigns, etc. UV400 Protection. When ordering blank items of this product either exactly 1 or atleast '+70+' must be ordered!